Avalanches involve the rapid downslope movement of snow or ice, with or without sediment and rock. Avalanches require a combination of steep slopes and a heavy snowfall. A common trigger is the deposition of wet snow over ice or a hard crust, with failure occurring at the base of the snow. Alternatively, high winds can produce a cornice, which may break off, causing an avalanche on the slope below. Incidences of avalanches in Newfoundland and Labrador are shown in the following map. In the late part of the 19th century and the first few years of the 20th century, several serious avalanches affected mining operations and communities on the Baie Verte Peninsula, and in the Bay of Islands. Sixteen people were killed in these disasters; the most complete documentation is for the March 11, 1912 avalanche that occurred at Tilt Cove. 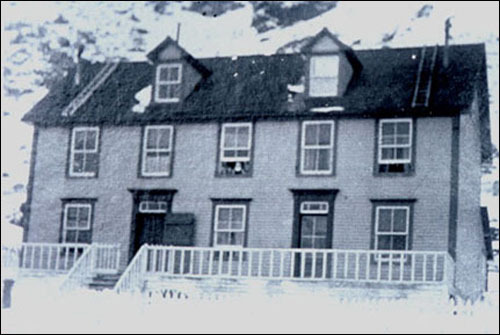 An avalanche struck two houses built at the head of the cove at the foot of a steep slope, one belonging to Mr. Francis Williams, manager of the Cape Copper Company, and the other belonging to a Mr. Cunningham, JP, the telegrapher and customs officer. The Williams' home at Tilt Cove, ca. 1910. 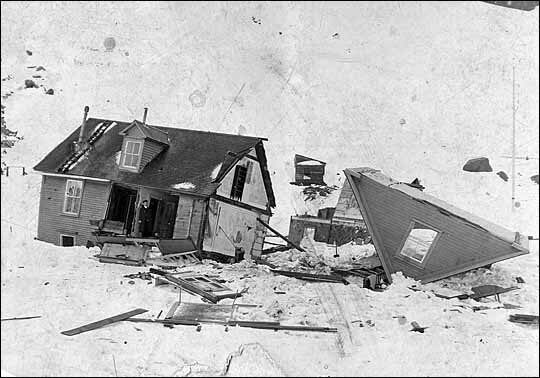 The destroyed Williams' home following the avalanche in March 1912. In each home, the families were sitting down to tea when the avalanche struck. Vera Alcock, the daughter of Mr. Cunningham, was interviewed in 1996, and recalled that a heavy snow fall had followed freezing rain the previous day. Both houses were smashed by the avalanche, and Mr. Williams and his 13-year-old son were killed instantly. Two servants in the Williams household were also killed. Mrs. Williams and her two daughters were rescued after three and a half hours of burial, without serious injury. In the Cunningham household, most survived with minor injuries, but Edward Cunningham, aged 3, and a servant, Emily were buried, and crushed against the wood stove. They were rescued after two hours of digging. Edward survived with minor burns thanks to the efforts of Emily to keep him safe. Emily, however, was severely burned and died later. 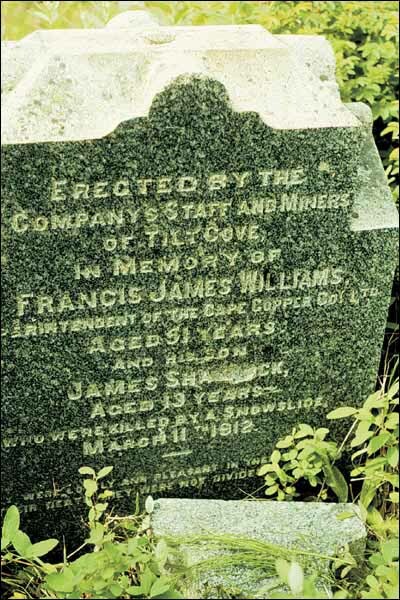 Francis Williams and his son were killed by an avalanche in Tilt Cove in 1912. Reproduced by permission of the Government of Newfoundland and Labrador © 1992.